Waterloo Region Against Line 9 | United in opposition to the Enbrige pipeline reversal project. At issue is whether the Crown exercised its duty to meaningfully consult and accommodate the Chippewas on a project that may potentially impact their Aboriginal and Treaty rights. The Chippewas are challenging the Crown’s paternalistic policies based on denial and extinguishment of rights. Relying on s. 35 of the Constitution and previous Supreme Court rulings, the First Nation continues to urge negotiation and reconciliation. Chief of the Chippewas of the Thames, Leslee White-Eye welcomed the decision, saying, “Our community is pleased by this forward step but the path before us is still long as we continue to seek protection of our Aboriginal and Treaty rights. We need to bring home that we are not acting alone in the action, nor that it is for our sole benefit but an attempt to seek protection of our water – these energy developments are one of many across the nation impacting our rights”. Land Protectors Shut Down Enbridge’s Line 9 Near Aamjiwnaang! This morning individuals have shut of the flow of oil on Enbridge’s line 9 pipeline. At 7:30 this morning, individuals used the manual hand wheel at a valve site to shut off the flow of oil through line 9 as an act of protest. They have locked themselves on site to prevent the operation of the pipeline. Read more about Land Protectors Shut Down Enbridge’s Line 9 Near Aamjiwnaang! Prior to the Waterloo premier of the documentary This Changes Everything on October 7th, 2015, a #NoLine9 demonstration was held in the uptown square which called on the Canadian government, the national energy board, and the Enbridge pipeline company to stop moving forward with the line 9 pipeline project until the Chippewas of the Thames First Nation has their demand for proper consultation met. In this podcast you will hear first from Rachel T, a Waterloo-based activist who discussed the line 9 project, the dangers of pushing diluted tar sands bitumen through pipelines, and how stopping line 9 and all pipeline project can help fight climate change. Next you will hear from Amy Smoke, a Mohawk woman and the president of the Aboriginal Students Association at the University of Waterloo who spoke of a history of strong women fighting for indigenous rights and sovereignty. The third speaker you will hear is Myeengun Henry, an educator and band councillor of the Chippewas of the Thames First Nation. Myeengun spoke of the impacts of residential schools and colonisation on his community and the challenges those impacts now pose in maintaining control over treaty land when resource projects are pushed through. Myeengun also discussed the ongoing court battle around the line 9 pipeline which is working its way through the higher courts; the attempted negotiations with Enbridge which included him receiving a ring made from the wreckage of the 2010 line 6 disaster; and the failure of the government to uphold any duty to consult or otherwise respect the Chippewas of the Thames First Nation. Myeengun calls on the Canadian government to move away from tar sands and fracked oil, and other fossil fuel production and to start respecting existing treaties such as they are a party to between the Chippewas of the Thames First Nation and other indigenous communities impacted by the line 9 decision. The demonstration ended with several drummers playing a song of resistance before the crowd followed Myeengun to the movie premiere, where he also addressed the audience on the topic of Line 9 and treaty responsibilities. 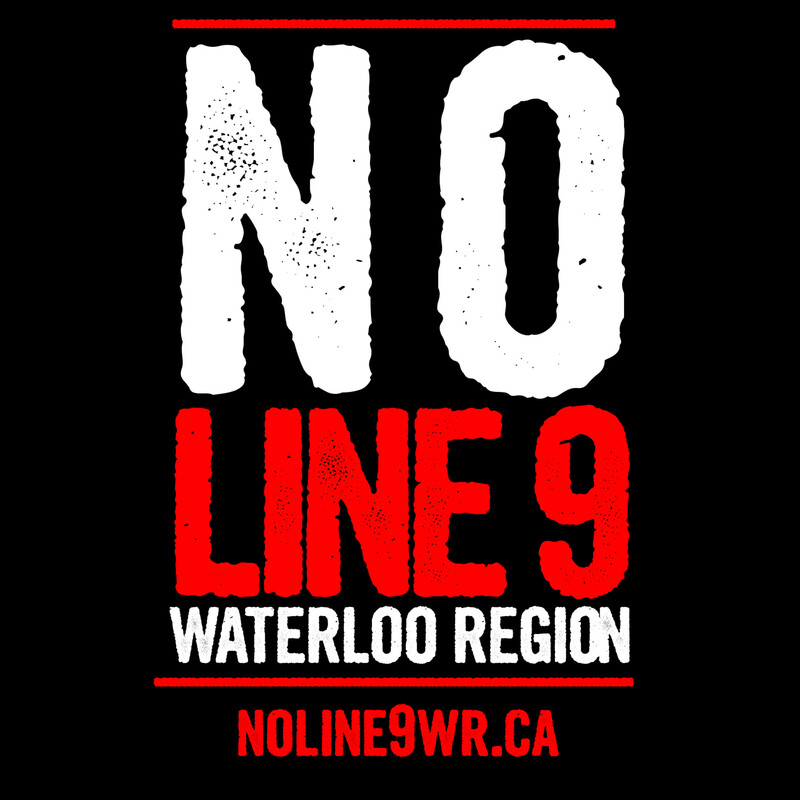 Waterloo Region Against Line 9 Fall Newsletter - Updates & Action Items! Read more about Waterloo Region Against Line 9 Fall Newsletter - Updates & Action Items! This evening (Nov 12, 2015) the Chippewas of the Thames First Nation in southern Ontario announced that they will launch an appeal to the supreme court of Canada regarding the decision to approve the reversal of Enbridge's line 9 pipeline. If the project is allowed to proceed it will result in Bakken fracked oil and diluted tar sands bitumen piped across every river flowing from southern Ontario into the great lakes in a 40 year old pipeline which was not designed for extreme energy transportation. Opposition to Line 9 Continues from Sarnia to Montreal! LINE 9 UPDATE: Opposition continues from Sarnia to Montreal! showing that there is opposition all along the line. $400 for the legal fund. A decision on their appeal is expected this fall. Read more about Opposition to Line 9 Continues from Sarnia to Montreal! Are you interested in local food systems, clean water, and a healthy, vibrant environment? Do you want to learn more about the Grand River watershed and the treaties that bind us as residents of this land? If so, then come to the No Line 9 fundraiser barbeque *this Sunday, August 23, 1pm, in Victoria Park*. On Wednesday July 15 at 7pm, there will be an open meeting on the ongoing resistance to the ‪#‎line9‬ pipeline. The meeting will be held at the Queen Street Commons Cafe on Queen St in Kitchener (at the back) and we will be updating folks on the current situation with line 9 (and the fact that it is still not pumping oil due to community pressure) as well as discussing ways to keep the pressure on the National Energy Board to withdraw their initial approval of the reversal project. Ahead of the June 16th court date for the Chippewas of the Thames First Nation, Rachel Avery and Dan Kellar of Waterloo Region Against Line 9 have written an article for the Media Coop discussing the federal appeal, constitutional responsibilities, third party consultation, as well as the ongoing risks associated with the Line 9 pipeline reversal project. Want to know more about the Chippewas of the Thames’ appeal? Want to learn about the treaty rights and responsibilities that are relevant to projects like Line 9? Come hear Myeengun Henry of Chippewas of the Thames First Nation speak about the legal challenge and the community’s concerns, and how you can support their efforts.